Delicious cinnamon-apple filling in a buttery crumb crust makes this apple pie the perfect dessert for any occasion! 1. In a large bowl, combine the flour, brown sugar, oats and melted butter or margarine until crumbly. Set aside 1 cup; press remaining crumb mixture into bottom and up the sides of an ungreased 9-inch pie plate; set aside. 2. In a large saucepan, combine the sugar, cornstarch, water, cinnamon and nutmeg until smooth. Bring to a boil over medium heat; cook and stir until thickened, about 2 minutes. Remove from the heat; stir in the apples and vanilla extract. 3. 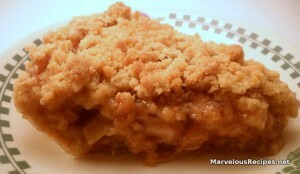 Pour apple mixture into the prepared crust; top with the reserved 1 cup crumb mixture. Bake at 350 degrees F for 40 to 45 minutes or until crust is golden brown. Cool on wire rack. Makes 8 servings. what is better than an apple pie??? ?